The Letter to this article has been published. Metabolic alkalosis is common in patients with respiratory failure and may delay weaning in mechanically ventilated patients. Carbonic anhydrase inhibitors block renal bicarbonate reabsorption, and thus reverse metabolic alkalosis. 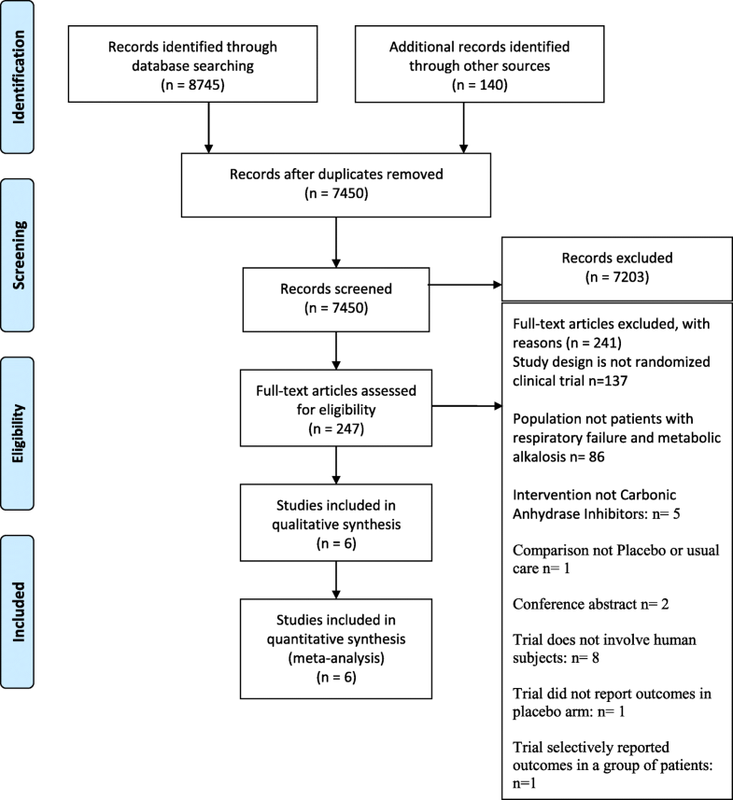 The objective of this systematic review is to assess the benefits and harms of carbonic anhydrase inhibitor therapy in patients with respiratory failure and metabolic alkalosis. We searched the following electronic sources from inception to August 2017: the Cochrane Central Register of Controlled Trials (CENTRAL), MEDLINE, EMBASE, and SCOPUS. Randomized clinical trials were included if they assessed at least one of the following outcomes: mortality, duration of hospital stay, duration of mechanical ventilation, adverse events, and blood gas parameters. Teams of two review authors worked in an independent and duplicate manner to select eligible trials, extract data, and assess risk of bias of the included trials. We used meta-analysis to synthesize statistical data and then assessed the certainty of evidence using the GRADE methodology. Six eligible studies were identified with a total of 564 participants. The synthesized data did not exclude a reduction or an increase in mortality (risk ratio (RR) 0.94, 95% confidence interval (CI) 0.57 to 1.56) or in duration of hospital stay (mean difference (MD) 0.42 days, 95% CI −4.82 to 5.66) with the use of carbonic anhydrase inhibitors. Carbonic anhydrase inhibitor therapy resulted in a decrease in the duration of mechanical ventilation of 27 h (95% CI −50 to −4). Also, it resulted in an increase in PaO2 (MD 11.37 mmHg, 95% CI 4.18 to 18.56) and a decrease in PaCO2 (MD −4.98 mmHg, 95% CI −9.66, −0.3), serum bicarbonate (MD −5.03 meq/L, 95% CI −6.52 to −3.54), and pH (MD −0.04, 95% CI −0.07 to −0.01). There was an increased risk of adverse events in the carbonic anhydrase inhibitor group (RR 1.71, 95% CI 0.98 to 2.99). Certainty of evidence was judged to be low for most outcomes. In patients with respiratory failure and metabolic alkalosis, carbonic anhydrase inhibitor therapy may have favorable effects on blood gas parameters. In mechanically ventilated patients, carbonic anhydrase inhibitor therapy may decrease the duration of mechanical ventilation. A major limitation of this finding was that only two trials assessed this clinically important outcome. Metabolic alkalosis is common in patients with respiratory failure [1, 2]. There is evidence that increased pH level in the cerebrospinal fluid may depress respiratory drive and may delay weaning in patients with respiratory failure on mechanical ventilation [3, 4]. Carbonic anhydrase inhibitors (CAI) (such as acetazolamide, methazolamide, and dichlorphenamide) block renal bicarbonate reabsorption, and thus reverse metabolic alkalosis . However, uncertainty remains about their effects in the setting of respiratory failure with concurrent metabolic alkalosis on duration of hospitalization, mechanical ventilation (MV), or noninvasive positive-pressure ventilation (NIPPV), and mortality . A Cochrane systematic review on the use of CAI for hypercapnic ventilatory failure in chronic obstructive pulmonary disease (COPD) identified four eligible trials. The review found that acetazolamide therapy resulted in a significant improvement in PO2 and a nonsignificant decrease in PaCO2. However, the included studies had a limited number of participants (84 patients), had short-term follow-ups, did not assess clinically important outcomes such as duration of hospitalization and mortality, and none included patients on NIPPV or MV . Since the publication of the Cochrane review in 2001, several trials have been published [6–8]. In a multicenter randomized controlled trial (RCT), acetazolamide therapy in 382 patients with COPD and metabolic alkalosis on mechanical ventilation resulted in a 16-h decrease in the duration of mechanical ventilation compared with placebo (95% confidence interval (CI) −36.5 to 4.0 h; p = 0.17) . A smaller trial with 22 patients with COPD with respiratory failure, metabolic alkalosis, and on NIPPV, found that acetazolamide therapy significantly reduced the duration of NIPPV compared with a matched control group (6 ± 8 versus 19 ± 19 days; p = 0.03) . Given the current uncertainty about the benefits and harms of using CAI in patients with respiratory failure and metabolic alkalosis, it would be informative for clinical practice to synthesize and critically appraise the current body of evidence. The objective of this systematic review was to assess the benefits and harms of carbonic CAI therapy in patients with respiratory failure and metabolic alkalosis. The detailed methods are included in Additional file 1. RCTs were included if they recruited patients with respiratory failure and concurrent metabolic alkalosis (as defined by the individual trial), including patients on MV or NIPPV. In addition, the trial should have compared CAI to either placebo or usual care. All co-interventions should have been similar for the two comparison groups. The primary outcomes of interest were duration of hospital stay, duration of MV or NIPPV, mortality, and adverse events. Secondary outcomes included the blood gases parameters PaCO2, PO2, HCO3, and PH. We searched the following electronic databases from inception to August 2017: the Cochrane Central Register of Controlled Trials (CENTRAL), MEDLINE, EMBASE, and SCOPUS. Figures 1 to 4 in Additional file 2 detail the electronic search strategy. There were no language or date restrictions. We also screened the reference lists of included trials and identified related systematic reviews. The search strategy did not include attempts at collecting unpublished data. Teams of two review authors (BYT and CN, and HSI and MOO) screened independently and in duplicate the abstract and title of every record captured by the searches. We retrieved the full texts for all citations judged as potentially eligible by at least one reviewer. The teams of two reviewers then assessed the full texts for eligibility using a standardized screening form. A PRISMA (preferred reporting items for systematic reviews and meta-analyses) flow-chart was used to summarize the results of the selection process  (Fig. 1). We extracted information about the study design, the clinical characteristics of the trial (population, intervention, comparator, and outcomes), funding, and conflicts of interest of the authors. Risk of bias was assessed using The Cochrane Collaboration’s Risk of Bias tool [10, 11]. The following criteria were used: random sequence generation (selection bias), allocation concealment (selection bias), blinding of participants, providers, data collectors, outcome adjudicators, and data analysts (performance bias and detection bias), incomplete outcome data (attrition bias), selective outcome reporting (reporting bias), and other biases (including early stopping for benefit). Risk of bias criteria was judged as ‘low risk’, ‘high risk’ or ‘unclear risk’ as described in the Cochrane Handbook for Systematic Reviews of Interventions . For dichotomous data, we used the risk ratio (RR) with 95% CIs. For continuous outcomes data, we used, whenever possible, the mean change score from baseline to follow-up for each intervention group. One of the of the included trials (Nelson and Wallace, 1965 ) did not report standard deviations (SDs) in the assessment of the outcomes for PaCO2 and serum bicarbonate. Therefore, we used the median SD from the other included trials that reported SDs for these outcomes, as described in Furukawa et al. . In another trial (Faisy et al., 2016 ), the authors did not report means and SDs and so these were extrapolated respectively from the reported medians (mean = median) and interquartile range (IQR) (SD = IQR/1.35) . In Hacki et al., 1983 , outcomes data were extracted from a graph in the report using the WebPlotDigitizer tool . We pooled data using the random-effects model for the primary meta-analyses . Heterogeneity (inconsistency) between study results was assessed using the I2 statistic. An I2 value of 50% or more was indicative of a considerable level of heterogeneity . To explain any heterogeneity, we planned to conduct subgroup analyses based on the following variables: specific type and dose of CAI, etiology of respiratory failure, spontaneously breathing patients or on MV or NIPPV, and severity of metabolic alkalosis. We also planned to perform sensitivity analyses to explore the influence of the following factors (when applicable) on pooled effect sizes: restricting the analyses to studies with low risk of bias, restricting the analyses to studies with longer follow-up, and assessing the impact of missing data. [18–21]. Certainty of the evidence for each outcome was assessed using the Grading of Recommendations Assessment, Development and Evaluation (GRADE) approach . This approach classifies the certainty of evidence into four categories: high, moderate, low, and very low. It takes into account the following factors: risk of bias , imprecision, inconsistency , indirectness , and publication bias . We developed a Summary of Findings (SoF) table using the GRADEpro/GDT tool . Figure 1 shows the study flow chart. Out of 7450 screened citations, six eligible studies were identified with a total of 578 participants. Table 1 summarizes the characteristics of the included studies. Five trials were in the English language, and one trial was in German. All studies were randomized. Four trials used a parallel group design [6, 8, 28, 29], one trial used a cross-over design , and one trial  used a cross-over design during the short-term intervention and a parallel design during long-term intervention. Outpatient COPD with either an arterial oxygen saturation of less than 90% or PCO2 of 53 mmHg or more and metabolic alkalosis with CO2 content 31.6 at baseline. Only two trials (Faisy et al. and Rialp Cervera et al.) included patients on mechanical ventilation [6, 8], while the other four trials included outpatients and inpatients not on mechanical ventilation. Four trials included COPD patients exclusively [12, 28–30]. In the study by Rialp Cervera et al., 90% of participants had COPD while 10% had obesity hypoventilation syndrome . Faisy et al. included patients on mechanical ventilation secondary mostly to community-acquired pneumonia and bronchitis . Five trials evaluated acetazolamide, while one trial (Nelson and Wallace) evaluated dichlorphenamide . Additional file 2 (Table S5) details the funding and conflicts of interest of authors in the included trials. Additional file 2 (Figure S1) and Table 2 summarize the risk of bias assessment in the included trials. Most of the included trials were judged to have a low risk of bias for most of the criteria. An unclear risk of bias was judged for some trials [6, 12, 29, 30], especially when methods of random sequence generation and allocation concealment were not specified. A high-risk attrition bias was judged for Nelson and Wallace because 12 patients were included in the final analysis out of the initial 19 patients included in the trial . A high “other risk of bias” was also judged for Faisy et al. , taking into consideration that we extrapolated means and SDs as described above. The analysis based on the two trials that reported mortality did not exclude a reduction or an increase in mortality (RR 0.94, 95% CI 0.57 to 1.56; I2 = 0%). Certainty of evidence was judged to be low due to very serious imprecision (Additional file 2: Figure S2; see the SoF in Table 3). Only two trials assessed the duration of hospital stay, and the pooled analysis did not exclude a reduction or an increase in duration of hospital stay (mean difference (MD) 0.42 days, 95% CI –4.82 to 5.66; I2 = 33%) (Additional file 2: Figure S3). Certainty of evidence was judged to be low due to very serious imprecision (Table 3). Pooled data from the two trials that included patients on MV found that CAI therapy resulted in a 27.09-h mean reduction in duration of MV (95% CI –50.11 to −4.08; I2 = 0%) (Additional file 2: Figure S4). Certainty of evidence was judged to be low due to imprecision and serious risk of bias (Table 3). The main analysis included five trials and excluded Faisy et al. because they reported daily mean change in PaCO2. The meta-analysis showed that CAI therapy resulted in a mean reduction of −4.98 mmHg in PaCO2 (95% CI −9.66 to −0.30; I2 = 95%) (Fig. 2). The result did not change substantially after including Faisy et al. using the standardized mean difference (SMD) (Additional file 2: Figure S5). The main analysis included three trials and excluded Faisy et al. and Rialp Cervera et al. who reported Pa/FiO2, and Nelson and Wallace who did not report on this outcome. The meta-analysis showed that CAI therapy resulted in a mean increase of 11.37 mmHg in PaO2 (95% CI 4.18 to 18.56; I2 = 98%) (Fig. 3). The results still favored the CAI group when we included Faisy et al. and Rialp Cervera et al. using SMD (Additional file 2: Figure S6). The main analysis included two trials and showed a mean reduction of 5 meq/L in serum bicarbonate in the CAI group (95% CI −6.52 to −3.54; I2 = 0%) (Fig. 4). Using SMD, we pooled data from trials that reported base excess as a surrogate for serum bicarbonate, and the result showed a reduction in SMD of −3.98 meq/L (95% CI −5.47 to −2.49; I2 = 94%) (Additional file 2: Figure S7). The main analysis excluded Faisy et al. because they reported the daily mean change in pH. The results showed a mean reduction in pH of 0.04 in the CAI group (95% CI −0.07 to −0.01; I2 = 98%) (Fig. 5). The result did not change substantially when Faisy et al. was incorporated using SMD (Additional file 2: Figure S8). The analysis from the five trials that reported on adverse outcomes showed an increased risk of adverse events in the CAI group (RR 1.71, 95% CI 0.98 to 2.99; I2 = 19%) (Fig. 6). Certainty of evidence was judged to be moderate due to imprecision (Table 3). This result was mainly driven by increased incidence of mild side effects such as vertigo, paresthesia, nausea, vomiting, headache, skin rash, and abdominal discomfort in Nelson and Wallace and Vos et al. [12, 29], and increased incidence of hypokalemia and serum bicarbonate < 23 mmol/L in the acetazolamide group in Rialp Cervera et al. . In the study of Hacki et al., the authors reported that no side effects or severe metabolic acidosis were noted in the two groups . On the other hand, there was no increased incidence of serious adverse reactions in the CAI group in the study of Faisy et al., as defined by events that required intensive care procedures and/or surgery, and events that prolonged hospitalization or resulted in persistent or major disability/incapacity, and in Rialp Cervera et al. as defined by serum creatinine > 2.5 g/dL, bilirubin > 3.5 mg/dL, prothrombin activity < 40%, leukocyte count < 4 × 109/L, platelets < 150 × 109/L, appearance of seizures, or severe allergic reaction [6, 8]. Pre-planned subgroup and sensitivity analyses were not possible because of the limited number of included trials. In summary, we did not find definitive results for the effects of CAI therapy on clinically important outcomes such as mortality and duration of hospital stay in patients with respiratory failure and metabolic alkalosis. The results suggest that CAI therapy may decrease the duration of mechanical ventilation. There was a trend towards increased incidence of adverse events in the CAI group; however, most of these adverse events were mild. On the other hand, the results suggest that CAI therapy has favorable effects on arterial blood gas parameters (PaCO2, PaO2, bicarbonate and pH), with decreased PaCO2, increased PaO2, and, as expected, decreased bicarbonate and pH levels. The main strength of the current review is the use of rigorous systematic review methods. Also, inclusion criteria were restricted to well-designed RCTs with an overall low risk of bias. The limitations of the current systematic review relate to those of the included studies, mainly their limited number. In addition, some of the included studies did not report all the data required to include them in the meta-analyses. For example, Nelson and Wallace did not provide SDs, and Faisy et al. reported medians and IQRs but not means and SDs. Furthermore, most trials used acetazolamide, and most patients had COPD, and thus our results may not be applicable to CAIs other than acetazolamide and in respiratory conditions other than COPD. A previously published systematic review focusing on patients with COPD and hypercapnic respiratory failure included four trials with 84 participants. That study reported that acetazolamide therapy significantly decreased pH and serum bicarbonate and significantly increased PaO2, and led to a small decrease in PaCO2. The study reported those results as not statistically significant . We have excluded two of the trials included in that review (Skatrud and Dempsey  and Wagenaar et al. ) because they did not meet our eligibility criteria. Skatrud and Dempsey reported outcomes exclusively in patients deemed as “correctors” to acetazolamide, and in Wagenaar et al. the arms comparing acetazolamide with placebo were not randomized [31, 32]. Furthermore, none of the trials included in that previous review assessed clinically important outcomes. The present review included six trials with a total of 564 participants, and it provides higher certainty evidence for the favorable effects of CAI therapy on blood gases parameters. In addition, two trials included in our review assessed clinically important outcomes. Although the results of the pooled analysis concerning mortality and duration of hospital stay are not conclusive, they suggest a possible decrease in the duration of mechanical ventilation in the CAI group compared with placebo. This clinically important outcome should be confirmed in future larger randomized clinical trials. The present systematic review demonstrates that carbonic anhydrase inhibitors are associated with favorable blood gas parameters in patients with respiratory failure and metabolic alkalosis, but did not provide conclusive results for clinically important outcomes. Future well-designed and large randomized trials should investigate the effect of carbonic anhydrase inhibitors on these outcomes, particularly mortality, duration of hospital stay, and duration of mechanical ventilation. A comment to this article is available online at https://doi.org/10.1186/s13054-019-2384-y. We acknowledge the contribution of our university librarian Ms. Aida Farha in the design of the search strategy and providing full-text material for our systematic review. We also acknowledge Dr. Bouchra Tawk for her help in translating and abstracting data from the article in the German language, and Dr. Assem Khamis for his help with the statistical analysis. The authors declare that they did not receive any funding for this work. The datasets used and/or analyzed in the current study are available from the corresponding author upon request. BYT, HSI, CN, EAA, PKBK, and SSM designed the study. TL and MOO designed the search strategy and performed the search. BYT, HSI, CN, MOO, and TL performed abstract screening, full text screening, data extraction, and risk of bias assessment. BYT and MOO performed data analysis. SSM, PKBK, and EAA helped in finalizing the full text screening, and in data interpretation. EAA participated in the statistical analysis, risk of bias assessment, and the rating of the certainty of evidence. BYT drafted the manuscript. All authors revised the manuscript and read and approved the final manuscript. Jones PW, Greenstone M. Carbonic anhydrase inhibitors for hypercapnic ventilatory failure in chronic obstructive pulmonary disease. Cochrane Database Syst Rev 2001(1):Cd002881. https://www.ncbi.nlm.nih.gov/pubmed/11279770. Higgins JPT GS. Cochrane handbook for systematic reviews of interventions Version 5.1.0 The Cochrane Collaboration, 2011; 2011 [updated updated March 2011]. Available from: Available from https://handbook-5-1.cochrane.org/. Accessed Aug 2017. Hacki M, Waldeck G, Brandli O. Acetazolamide in hypercapnic chronic obstructive pulmonary disease: a renaissance? Schweizerische medizinische Wochenschrift [Internet]. 1983; 113(3):[110–4 pp.]. Available from: https://www.cochranelibrary.com/central/doi/10.1002/central/CN-00175914/full. Rohatgi A. WebPlotDigitizer January, 2018. Version 4.1:[Available from: https://automeris.io/WebPlotDigitizer. Accessed Feb 2018. GRADEpro GDT: GRADEpro Guideline Development Tool [Software]. McMaster University, 2015 (developed by Evidence Prime, Inc.). Available from gradepro.org. Accessed Apr 2018.